No list of eCommerce website builders would be complete without Volusion, one of the powerhouses of the DIY website creation industry. This powerful eCommerce website builder has all the features required to launch a functional and visually appealing online store that will deserve the attention of thousands of aspiring entrepreneurs. The website builder is the top notch solution for business owners, who are looking for pain-free and effective means of growing their businesses. Volusion is the all-in-one eCommerce tool for devoted online store owners, who are concerned with their business advancement and wish to get the most out of their website performance. The system can boast a set of features and advantages that make it stand out from the crowd. It is equipped with all the tools an entrepreneur requires to increase the amount of sales and boost business performance. These are advanced SEO options, multi-channel integration, a dynamic CRM system, eCommerce and marketing tools etc. What’s more, Volusion is safe for each and every user. They ensure secure and credible transactions on your own domain, PCI certification, anti-fraud protection and other features that contribute to the utmost security of your online store. With the 24/7 live support provided by the system specialists and informative knowledge base, Volusion ranks high in the list of contemporary eCommerce website builders. However, benefits are just half the story. If you’re a non-tech-savvy user, you’ll face many roadblocks in your way when trying to set up your eCommerce website with Volusion, most of which are of web design customization variety. So let’s delve deeper into their admin panel to see how user-friendly and functional this platform is. Website Editor. Just like it is easy to make changes in website style, it’s also simple to edit product catalogue and pages of your online store here. You don’t have to be a web design pro to do that on your own. Just get to the dashboard and manage the website to your liking. Online Store Builder. Due to the online store building tool, entrepreneurs are able to manage their eCommerce websites with regard to their requirements and preferences, getting the most out of their functionality. The tool allows adding product categories, subcategories and new products, cope with SEO management features, upload and edit images and perform other actions that contribute to better website performance. CSS Editor. Even though, Volusion does not imply any coding skills or knowledge, it is still possible to make use of CSS website editing feature for all those users, who are aware of coding basics. Due to this tool, you can customize the website content by manually editing its code. As a result, you get a website that features utmost functionality and visual appeal. Navigation Editor. When it comes to selecting and modifying the navigation style of your website, the use of the navigation editor proves to be essential. It allows changing navigation styles to contribute to the simplicity of the web browsing process. Volusion offers a long list of features and tools, which make the use of the platform simple, convenient and quick. There is no need to possess coding skills to manage the online store on your own – the process is easy and hassle-free both for non-techies and web design experts. Barcode Generator. This feature allows creating custom product barcodes to simplify the inventory management process. This is a nice tool for inexperienced entrepreneurs, who are just starting their business career as well as for those, who are too busy to do this manually. Large Inventories. Volusion gives a nice chance to cope with lots of SKUs in no time. This contributes to better website performance and ease of product search. CSV File Product Import. This tool is a must-have for the owners of large online stores, which offer a rich assortment of products subdivided in lots of categories and subcategories. By using this feature, it becomes much simpler to upload new products by using a CSV file. Inventory Management System. The system provides an opportunity to see the product status and reorder quantity rates, send notifications about low stock amounts and perform other related actions. As a result, it becomes much simpler for a website owner to manage the available inventory. Apart from the features mentioned above, Volusion also offers a long list of tools that contribute to better performance of your online store created with the system. Some of these tools include vendor codes, warehouses set up, calculation of shipping rates, specific pricing feature, tax rate online calculator, easy order processing, advanced currency tools, easy gateway and payment processing, recurring payment collections set up, customer-account management feature, bot captcha functionality, cost-efficient shipping, drop shipping integration, admin permissions and history. There is also an opportunity to make use of the online store management mobile app to make it possible for busy merchants to run their businesses on the go by using their mobile devices. Custom Domain. The system grants an opportunity to connect a custom website domain to your own online store. This provides better visibility and higher search engine ranking of a website, which contributes to the ease of search. Favicon and Logo Upload. It’s impossible to run a successful business and promote a newly-built online store without popularizing it on the web. To make the website stand out from the crowd and beat niche competition, it’s a must to upload your own brand logo and favicon. Volusion has added this feature, making it possible to upload these elements to your website right after its launch. Powerful SEO. Effective online store promotion is unthinkable without powerful search engine optimization. The better your website is optimized for the search engines, the higher ranking it will eventually gain. SEO features are masterfully integrated into online stores created with Volusion, which is manifested through quick and simple metadata management (tags, descriptions, URLs etc.). This makes all your website pages, categories and products SEO-friendly. Admin Social Media Management. Successful online store promotion is impossible without effective social media management. Volusion has made it possible to link your social media accounts to your eCommerce website to make it easier for you to post the updates and news to the social networks directly from the system dashboard. This is a convenient and time-saving tool. Remarketing Emails. It’s important to keep track of those users, who visit your online store, place orders and abandon their shopping carts for different reasons. These situations are quite common and widespread and, thus, require quick reaction. With Volusion, it’s possible to send special follow-up emails to remind the customers of their abandoned orders and increase the amount of sales. Gift Certificates. Volusion makes it possible for entrepreneurs to generate gift certificates, which remain popular throughout a year, but are especially in demand on holidays and special occasions. This marketing tool helps build customer trust and grow your client base. Mentioned above are only a few marketing features Volusion offers to its users. Other tools that are popular nowadays include dynamic sitemap, editable robots.txt files, creation of customized and attention-grabbing newsletters, deals of the day, special offers, advanced discounts, affiliate programs, custom domain connection, ROI trackings, detailed reporting, Facebook, Amazon and eBay sales options and more. Homepage Slideshow. The slideshow feature allows displaying several products and special offers on a homepage. This attracts the attention of customers and focuses it on the products they might be interested in. Search Filter. Advanced search filter options make it simpler for users to find the products they are looking for in a quick and hassle-free way. Introduction of this feature will help save customers’ time and effort, contributing to the increase of sales and building their trust. Convertible Product Pages. You can make your website product pages more convertible with Volusion by enhancing their design. With this purpose, you can use multiple attention-grabbing product-related photos, videos, graphics and other design elements. This is one of the most effective ways to convert visitors into returning customers. Client Reviews. Users, who visit your online store looking for specific products, frequently browse through the comments and reviews of other customers, who have already shopped at your website. By adding a customer reviews section to your online store, you add credibility to your website. This feature also makes it possible to keep track of your customers’ satisfaction rate to further use this info to improve your online store performance. Related Products. The use of this feature allows inducing customers to have a look at products that are somewhat related to those they have been previously looking for, purchased or added to their shopping carts. Apart from this, Volusion also makes it possible to adjust product display customization, provide adequate customer knowledge base and an optimized one-page checkout feature etc. These tools ensure higher conversion rates of your online store, contributing to better results and web store performance. SSL Website Certification. SSL website certification provided by Volusion contributes to the enhanced security of your online store. By offering 24/7 customer support and side-wide https, the system makes sure the web stores created with it are not only Google-friendly, but also protected from different kinds of online frauds. Utmost Confidentiality. The system performs thorough checkout process, making sure all the financial transactions are safe and your credit card information is not disclosed to the third party members. 24/7 Online Store Accessibility. Online stores created with Volusion are accessible online and open for business almost 24/7. This contributes to better client servicing and increases the amount of sales. PCI Certification. Volusion offers reliable PCI certification, which contributes to the efficacy of security measures provided by the system. It assures that your clients’ credit card info will be preserved under any circumstances. Firewall Settings. Firewall settings customization allows the entrepreneurs to keep track of customers, who visit a website and decide, who of them won’t be able to do that in future because of the security reasons. Volusion can boast a rich collection of themes, which are a great match for any online store, irrespective of its niche specialization. All the templates are crafted in-house by Volusion designers who specialize in ecommerce. Themes are not only highly customizable, but they also adhere to sales conversion best practices. Volusion themes include multiple menu layout options and the Content Builder, a drag-and-drop tool with more than 150 configurations, that provide countless layout formats. Whatever template you will go for, it will be mobile-optimized right from the start. This is a must-have feature for a contemporary eCommerce website. The products are presented to the advantage here to keep the customers encouraged to buy them. When it comes to template customization, though, it’s not quite easy to do that for a newbie. So, if you have no programming background at all, your design customization options will be quite limited: you’ll be only able to switch default templates and perform basic WYSIWYG editing that will not influence the overall look of your store. For big changes, they offer ‘Advanced editing’ (CSS/HTML). Therefore, if you’re not an HTML guru, pick the most appropriate template from their library from the very beginning, because it can be difficult to modify it in the future. The good news is that you can switch templates anytime. It’s important to note that some design elements can’t be transferred from one template to another – these must be copied and pasted manually, due to the differences in layouts and navigation menus. 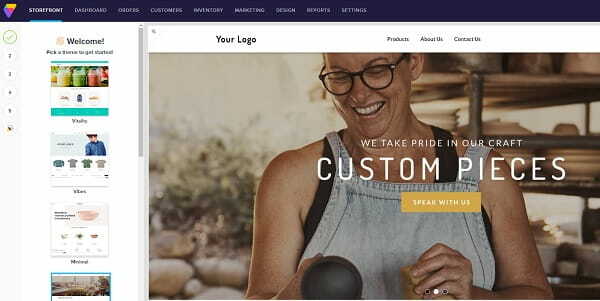 The cost of premium templates currently constitutes $180, but there are also free options you can make use of to launch a quality eCommerce website of your own. In case you want to go beyond the templates offered in their library, you may resort to the Volusion custom site design service. Volusion offers a huge knowledge base comprised of video tutorials, FAQs, eCommerce blog, ‘how to’ guides and even webinars. You can get in touch with a Volusion representative over phone, email or live chat. Taking care of the needs of clients and their customers, the service now also offers 24/7 tech support to ensure round-the-clock web presence and quality website performance. In addition to 24/7 support, Volusion also offers the ability for customers to schedule a call, which currently is at a 100% CSAT rating (the official business measurement of call customer satisfaction). Another Volusion client support feature is a team of in-house design and marketing experts (currently 47 experts total) who craft free resources for Volusion merchants including webinars, seasonal graphics, ebooks, blogs and videos for merchants who need a little assistance. These experts also provide paid services for things like SEO, PPC, Shopping Feeds and Design for merchants who do not have the time to manage these aspects of their business. Volusion’s pricing appeals to a wide range of pocket depths. Their cheapest plan is $15/mo ($13.50/mo if billed annually), while the most expensive is $135/mo ($121.50/mo). The more you pay, the more features you get. All transactions conducted via Volusion are fee-free, regardless of the chosen plan. They don’t have a native blogging platform. Because blogging is a great way to build relationships with your clients as well as drive traffic and enhance your online branding, not having a blogging platform is a significant drawback. Thus, Volusion loses ground to those eCommerce site builders that do offer at least basic blogging capabilities. I also find their interface a bit disorganized. One of the major Volusion competitors is Shopify. Some years ago Volusion and Shopify were at the same positions, but a review of 2016 and 2017 sales data showed Volusion stores produced 5.2x more revenue than Shopify’s stores. All in all these systems are very similar in functionality. You can read the detailed comparison of these eCommerce website builders in the corresponding post. If you are right about to create a powerful eCommerce website, then you can also consider using Squarespace for this purpose. To some extent, the system can be compared to Volusion as it also allows building online stores. However, the website builder is mostly used for universal web building purposes, being a nice choice for newbies. To find out more about the system and its distinctions, you can read the detailed Volusion vs Squarespace comparison in the related post as well. Volusion is a powerful and convenient eCommerce website builder, which works great for medium and large businesses. The system is customer-oriented and offers excellent functionality to meet any business web building needs and preferences. The website builder is reliable and comparatively easy-to-use, although, it may be a bit complicated for inexperienced users. At the same time, it’s possible to make use of understandable web customization features the system offers to give your eCommerce website top notch functionality and excellent design. The system is a reasonable choice for entrepreneurs aiming at establishing reliable web presence for their business.